US Master Spring Nationals, 2017 at Riverside City College. Is it easier to watch your kids compete? Or, swim yourself? I found out the answer at the US Masters Spring Nationals in Riverside, CA this past weekend. 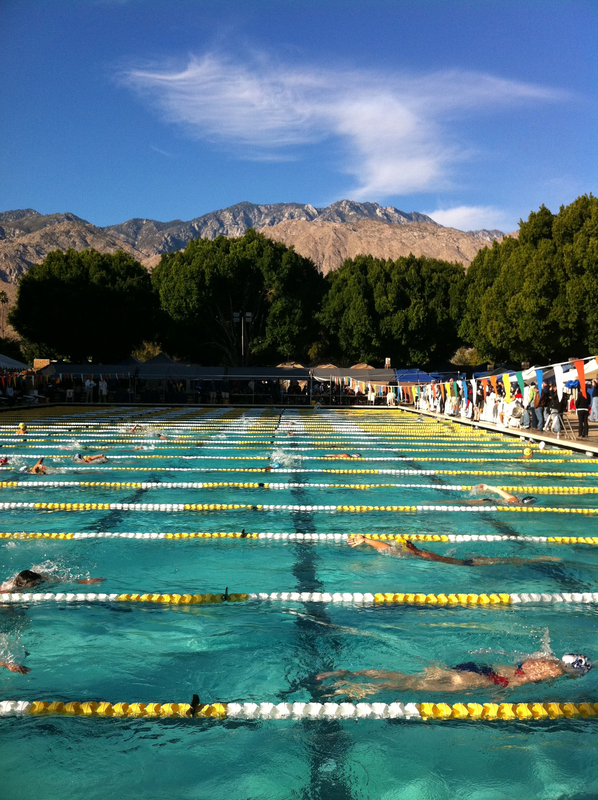 It was the second time I’ve competed in a swim meet in my entire life. I was nervous, anxious and wondered repeatedly, why on Earth did I sign up for the meet? Who do I think I am that I can dive in with Ryan Lochte and Nathan Adrian? 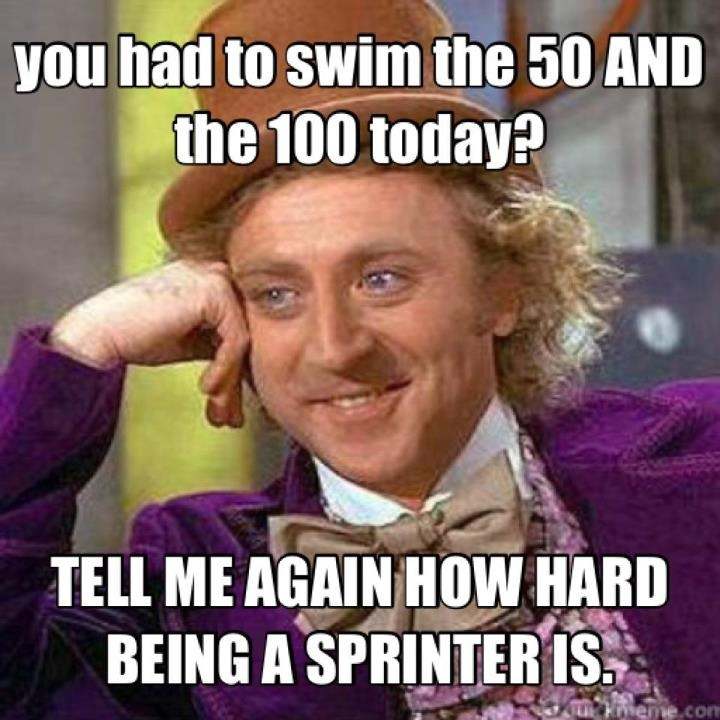 The answer from one of my fellow masters swimmers was “You’re not racing either of them!” True. I’m not in their age group, nor do I share their gender. But, still. Who do I think I am to swim at a meet with 2,026 swimmers and some of them Olympic champions? I am in my 50s, new to swimming—and slow. Me and two of my masters swim buddies. While riding in the back seat to the meet, with my husband and daughter up front, I looked back at car rides to meets with my kids with a smile. The mornings were filled with anticipation as I wondered what the day ahead would bring. I wasn’t nervous at all then. I hoped for a successful, fun day and a happy car ride home. But, when they were behind the blocks for their first event, I’d get a tight feeling in the pit of my stomach. I’d wring my hands and hope for a good race. I was a nervous wreck until their first race was over. Then I sighed with relief that yes, they actually could swim and I relaxed for the rest of the day. Then this past weekend at the pool, it was my turn to be the swimmer. I had a pit in my stomach. It was all up to me to get to the blocks in time for my race. I had my daughter at my side. She helped me with my cap, sprayed on sunscreen and held my towel. She said she’d been looking forward to this day. I wanted to make her proud. 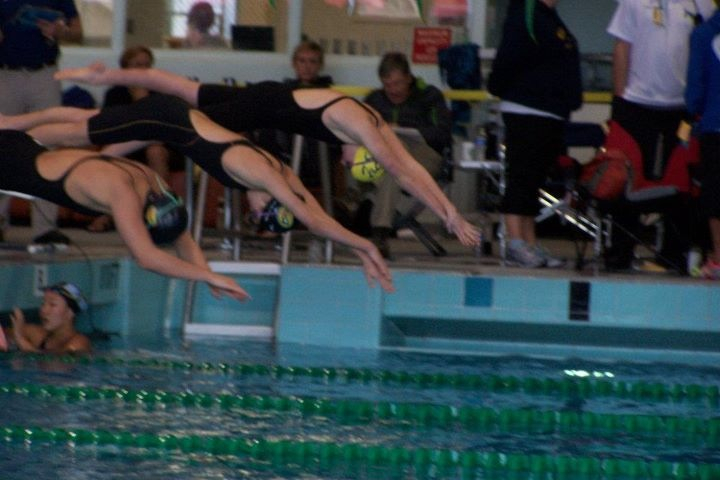 My daughter in the 8-and-unders, when she swam 25’s. She walked me to the warm-up pool and I stood there. She told me to get in and warm up. 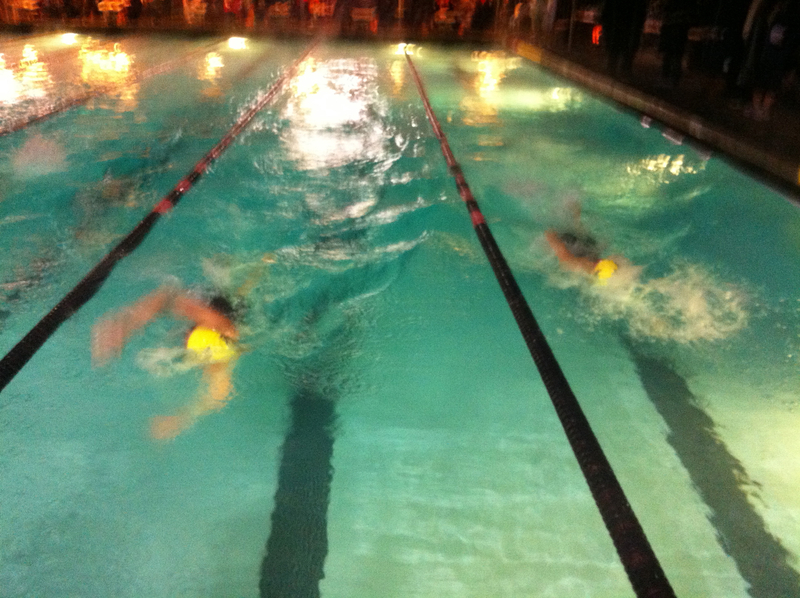 Each lane had seven or eight swimmers—real swimmers—not wannabes like me. They wore fast suits, flipped fast and hard. How could I get in with those sharks? “Mawm, get in!” she said. “Get in there, then,” she said pointing to the lane marked 65 and over. I do have some pride, so for the first three-hundred swim part of my warm up, I jumped into the mosh pit and repeatedly felt my foot pulled, got flipped turned on and stressed out on how I was going to make it through warm up. For my kick and drill sets, I did move over to the 65-and-over lane. After all, it was empty and I’m really, really slow when it comes to kicking and drills. It dawned on me that the race would be okay. I would have my own lane. If I could survive warm up, I could make it through my races in one piece. My daughter was at the end of my lane cheering for me along with my husband, coach and teammates. After my races, she told me how proud she was of me. Role reversal: my daughter sitting in the stands reading a good book. Sometimes it’s a good to switch roles with our kids. My daughter said after Masters Nationals, that she never wants to be a swim parent. After all, it was a long hot day, with two swims, hours and hours apart. But, in spite of that, she was a darn good one. She was encouraging, positive and her presence made me feel calm. I knew I had her unconditional love, no matter how I swam. She acted like a perfect swim mom. I could learn a few things from her. My 50-breast with husband and daughter cheering me on.